Reiki (pronounced Ray-key) is a Japanese technique for stress reduction and relaxation that also promotes healing. How do you feel? Healthy, happy, positive, motivated? If not….Try a Reiki Session – and then see how you feel!! Reiki is based on the idea that an unseen “life force energy” flows through us and is what causes us to be alive. If one’s “life force energy” is low, then we are more likely to get sick or feel stress, and if it is high, we are more capable of being happy and healthy. It is a simple, natural and safe method of healing. A Reiki treatment will leave you feeling re-energized, re-vitalized and re-motivated. Reiki is also a natural way to help pets and animals of all sizes feel better. I can help you hear, heal and harmonize with your animals! The gentle hands-on therapy promotes deep relaxation and restores balance to the entire body. Today more and more people and their animals are discovering the benefits of Reiki. You can too! 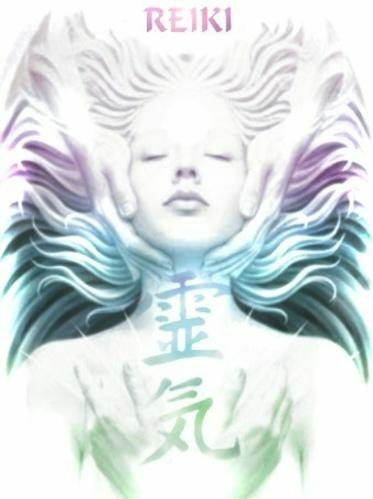 Reiki is a hands-on healing method that originated in Japan. The practitioner channels healing energy through her hands to the animal through a light touch either directly on the body or from a distance. The word Reiki (pronounced “ray-key”) is a Japanese composite word usually translated as “universal life energy”. It is based on the idea that all living beings have life energy flowing through them. When life energy is high, your pets are healthy and balanced, more relaxed and less likely to get sick. When it is low, they will often be more easily affected by stress and less resistant to illness. Reiki is a safe complement to conventional Western medicine, Chinese medicine, herbal medicine, homeopathy and all other forms of healing. Some pets may initially prefer to experience the energy from a slight distance, rather than having the practitioner’s hands directly on them. Reiki sessions for pets typically last 15-30 minutes. The frequency of sessions depends entirely on each individual animal’s health status and needs. Some health issues can be resolved in two or three sessions, others may take ongoing sessions on a recurring basis. As with all services Reiki by Mary Ann provides, frequency of sessions will be tailored to your pet’s individual needs. Interspecies communication is a unique opportunity for learning, clarity and healing. Through direct two-way information exchange, we increase mutual understanding and can work towards resolution of issues in our relationships with other beings. Psychic animal communication is natural; everyone can talk with animals! Most of us have simply forgotten how, but can recall instances from childhood or other times in our lives when we’ve been connected to our intuitive abilities and perceived things in a non-physical manner. We can all remember how to listen and perceive the true nature and essence of an animal’s unique personality and soul. The universal language of telepathy allows us to use our natural intuition and abilities to communicate with other species. Energetic preparation and intentional connection with the animal happens first. Information is then received in the form of thoughts, ideas, words, images, sensations in the body, sounds in the mind, emotions, sudden knowings, etc. Having the ability to communicate with animals is valuable in many different situations, enhancing shared knowledge and mutual understanding between animals and their persons. Past issues affect animals when stored energies (such as memories or traumas) result in tensions that cause the animal to alter its authentic behavior and be in a distressed state. With this increased awareness and closeness, you can create more loving and joy-filled relationships with your animal friends and indeed all of nature. Reiki is also a natural holistic way to help pets and animals of all sizes feel better. I can help you hear, heal and harmonize with your animals! The gentle hands-on therapy promotes deep relaxation and restores balance to the entire body. Today more and more people and their animals are discovering the benefits of Reiki. During a Reiki session with the horses, I am able to ask them questions they respond thru me. Horses have a lot to say, they tell me what they like, dislike and everything else. They all have different personalities. The owners verify the information I am giving. We all can communicate with our pets – this just adds clarity.